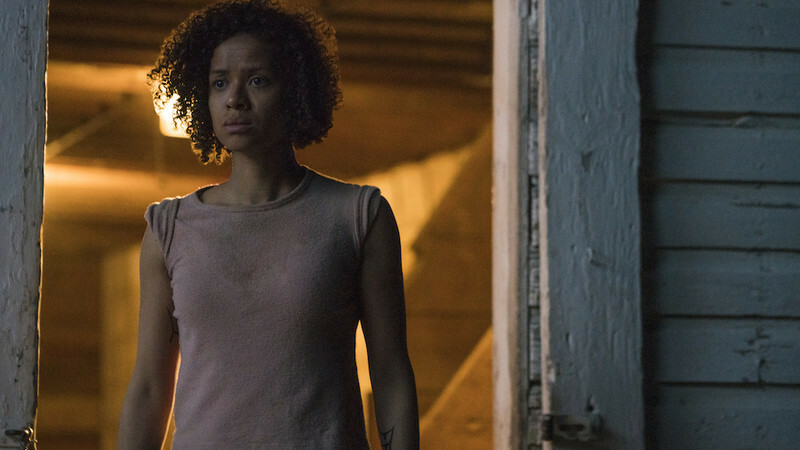 “Fast Color” has been described as a superhero origin story, but there are no radioactive spiders or exploding planets, and no one wears spandex. Director and co-writer Julia Hart's film is the story of three generations of women who all have some special power, and it's set in a near-post-apocalyptic Texas where water is scarce and expensive. Gugu Mbatha-Raw plays Ruth, a prodigal daughter returning home, where her mother (Lorriane Toussaint) and Saniyya Sidney plays Ruth’s daughter Lila. In an interview with RogerEbert.com, Mbatha-Raw talked about creating Ruth from the outside – posture, costume – and the inside, imagining the sensory experience of a literally seismic superpower. We see so much of Ruth’s history just form the way she carries herself and the way she walks. Tell me how you created the physicality of the character? I was so intrigued by Ruth when I read the script. She was described to me as this woman on the run and there was an energy about her that I wanted to capture, which was really this sort of wild quite feral fight or flight survival mode that she was in. And certainly when we first see her in the movie you get the sense that she's broken out of captivity almost; she's in rags and she's on the run from somebody. And I had the sense that she was probably always hungry and she was thirsty, so she was kicked into high adrenalized gear. That to me was really informative in terms of how she moves. And she's kind of jumpy because she's ready to defend herself at any moment, so that was a way in. And the way she stood and moved also came from also talking with Julia and the costume designer about the look for her, these boots that she had were essential, almost like a man's boot. It's as if she's been sleeping rough or had stolen some shoes and didn't have any socks, and there was a weight to these boots that really grounded her for me. So definitely that was key to the characterization. And she is almost androgynous certainly when we first see her in this sort of filthy dusty coat that again probably stolen from someone and you get the sense that she's definitely in a very wild state. So there was a lot of running and some action, and just keying into that element or nature. 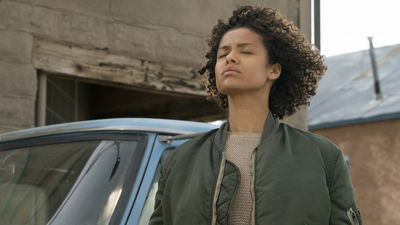 Gugu Mbatha-Raw in "Fast Color"
Ruth has very complicated feelings about her powers. She’s not the usual superhero. That's what I really loved about the story. It was so refreshing to me that it wasn't about destruction and it wasn't about a sort of male-dominated world. It wasn't about special effects and wearing a cape and a superhero suit, and all of the paraphernalia that we are used to in that genre. This was something much more raw and much more accessible and grounded, in terms of women being able to relate to the idea that they have this power within them and it's really about setting it free so that was really interesting to me. And again we never really are aspiring to be a superhero movie in the conventional sense. I think we are confronting that idea that you need all of these things to be powerful, and actually the power can be quite simple. It can be about grounding yourself and connecting to your family and confronting your past and centering yourself in who you are. And not numbing things that scare you, you know not being afraid to feel pain all of those things are powerful act in our contemporary world. So for me, I just thought that was refreshing and an angle on the genre that I have never seen before. But I've also never seen a superhero film where it's a powerful woman with special powers or a hero is also a mother. And I think that was another layer that [director/co-writer Julia Hart] was keen to bring. She says she was inspired to write the script when she had her first child. I think that the society sometimes has conditioned us to believe that becoming a mother means that other elements of your life have to power down. Julia says she found it to be an incredible and invigorating experience that was really inspirational to her creativity. And she only became a director once she became a mother, and that was again another side to the story that I think is an interesting conversation. Did you visualize or come up with some kind of a sense memory for the powers, to imagine how it would feel to actually be able to do the things that Ruth does? Yes, when we first see her having a seizure, I imagined it as something that you can't really control but it takes over your body and the motion of your body. That's quite terrifying for her, because inadvertently she could harm herself or harm people around her. So yes that was really how I kind of imagined it. And then once she's learned to harness her power, she's actually channelling it and powering it through her center. I used imagery and postures that I know from yoga, you know like mountain pose tadasana, which is the standing pose of power. You are the strength of a mountain in that pose. And it's a very simple posture you know, your palms are facing forward and you are breathing from a deeper place. So for me that was really about coming into your power, and I used the yoga as a metaphor for that. 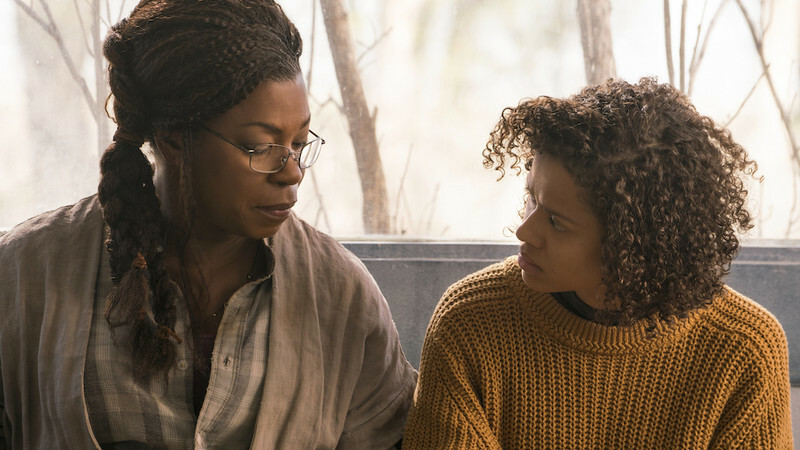 Lorraine Toussaint and Gugu Mbatha-Raw in "Fast Color"
How do you work with someone like Lorraine Toussaint to create that kind of deep history between your characters? Lorraine is just such a powerful presence in herself. I first saw her work in “Middle of Nowhere,” and I'd never met her but I was aware of her. That voice, that rich resonant voice that she has she brings such a soulful gravitas to any space. It's incredible. So she's very grounded and has that essence that was really easy to work with, to feel like she’s the matriarch of this word. I met Lorraine probably once before we started shooting in New York. We had lunch and talked about it. She has a daughter and I was an only child like Ruth so we definitely talked about those mother-daughter dynamics, and that unusual intensity between a single parent and a child, the mother daughter bond. So we both have experiences of that in our own life which were helpful. And then we talked with Julia about the backstory of Ruth being this special girl who also was troubling and who didn't know how to deal with her seizures and got into drugs and alcohol as a way to numb them. When we see her she's somewhat broken and in recovery. We see her with the sobriety chip and saying the Serenity Prayer. We talked about that sort of recovery process that she was in, so that really help grounded the relationship and the idea as we come to see towards the end of the movie that a part of the reason why Ruth abandoned her daughter was because she was afraid of hurting her. Julia talked to us about how motherhood is such a powerful thing but it's also terrifying. You can bring this life into the world but then there is also this fear because babies are so fragile. And what if I finally brought this amazing person into the world and what if I am not good enough or what if I can't look after them properly? There is that crippling fear that people sometimes have. 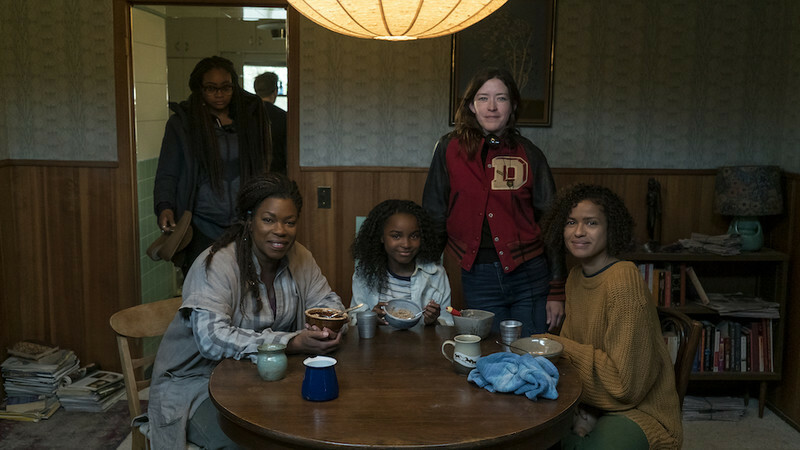 The director and stars of "Fast Color"
Why is it important to see these women characters like these in films? We don't have to discuss the fact that these are women of color in the film; it just is. But we absorb these powerful women of color. And I think there is so much that resonates much deeper than having a conversation about it. Julia was very intentional about setting this movie in the desert in the wild west of New Mexico with this very traditional male iconography of the Western out there in the desert. We look to films like “No Country for Old Men.” You traditionally see a man in this very barren landscape and he is surviving and saving the day. Julia was very intentional with placing a woman in that context and confronting expectations. Especially seeing a woman who is blood-spattered with greasy hair, and covered in dust in an environment which we are used to seeing dominated by man. All of the colors are very desaturated in the production design and in the clothes. I think it's really important to keep bringing this imagery into our culture, so then it becomes normal. It's something that all people can recognize themselves in. Our Far Flung Correspondents Write About "Life Itself"